Frontier® Cartridge is a division of Hornady® that uses state-of-the-industry loading techniques and quality control procedures to ensure the reliability and consistency of every round. 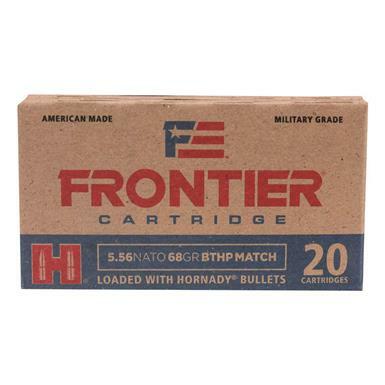 Made in the USA with military grade brass cartridge cases, primers and propellants. <b>NOTE:</b> While the 5.56x45mm NATO will fit in a 223 Remington chamber, the 5.56 is a military round that runs at higher pressures than it's 223 counterpart and is not recommended to be fired in 223 Remington chambers.